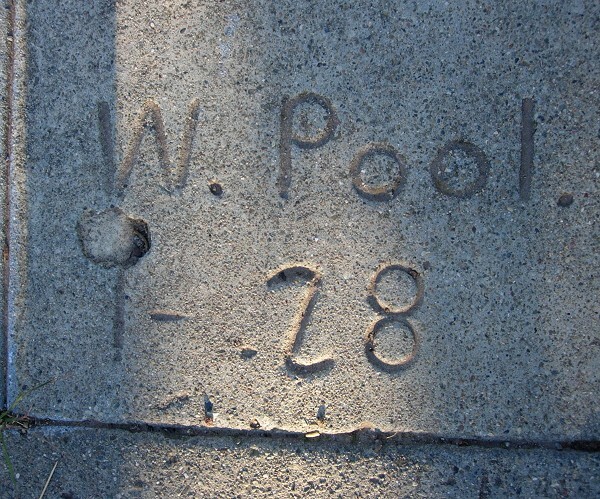 Walter B[yrd] Pool was born in 1864 in Windsor, Sonoma County, the son of Henry J. 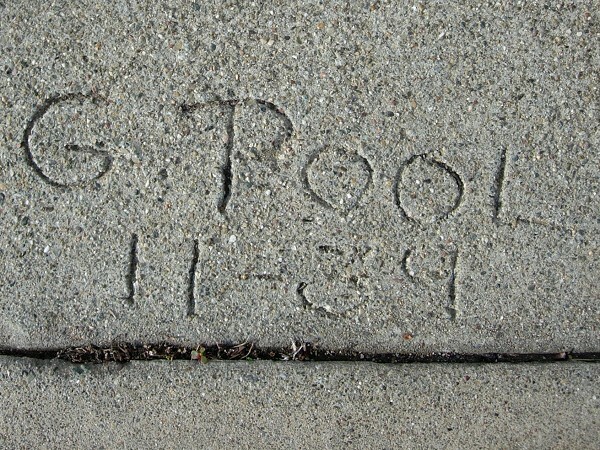 Pool, who had emigrated to California from Missouri. 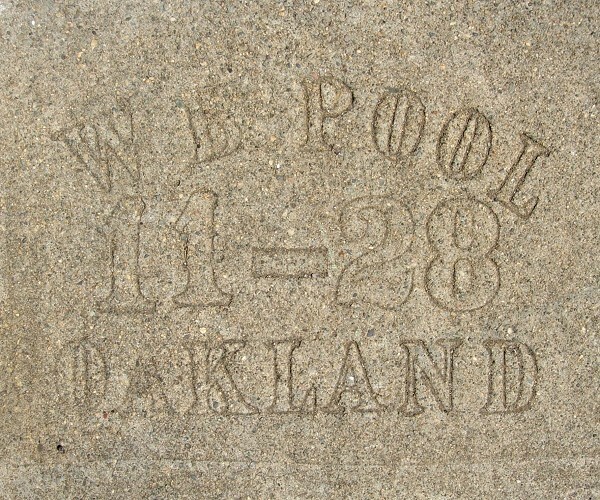 Although two of his brothers stayed in Windsor their whole lives, as of 1908 Walter was living in Oakland with his second wife, the former Meta Lehmkuhl (1879-1966), and their son Glenn at 674 E. 23rd Avenue. The following year they moved to a new home at 3221 Lorenzo Street and soon gained a daughter, Roma. He died in 1933 and is buried in Evergreen Cemetery. 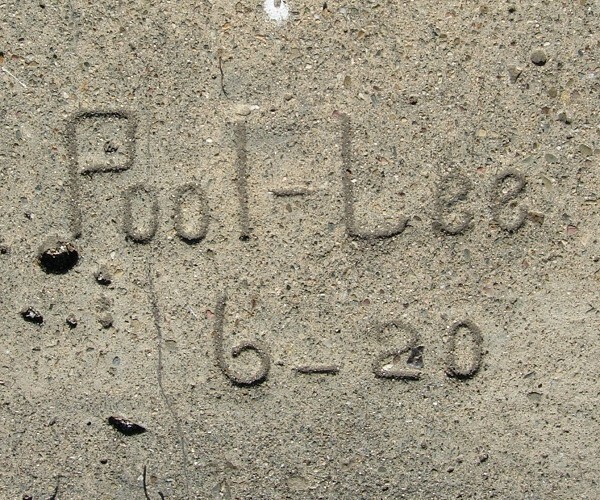 The oldest Pool mark I have is a “Pool-Lee” stamp from 1920, probably a collaboration with James B. Lee. 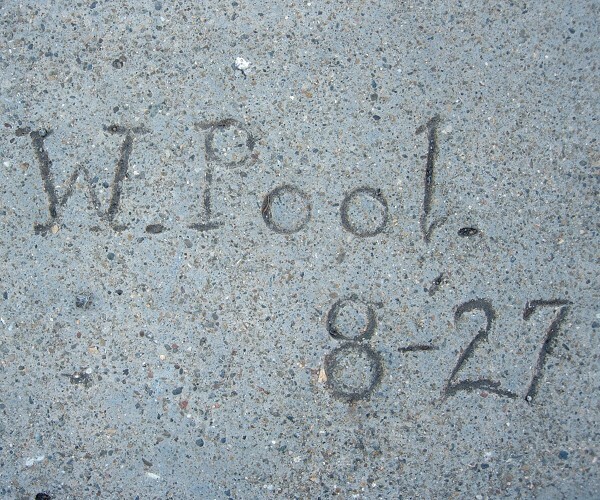 Another Pool-Lee mark dates from 1925, but Walter Pool was also working solo as “Pool” and “W. 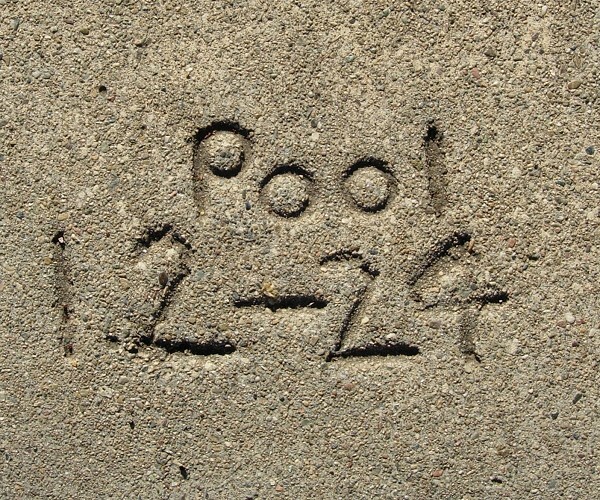 Pool.” He appears to have made his marks by hand with the edges of his tools. The results were striking and always varied. Here are some of my favorites. Finally, from 1931 I have a single example of a stamp (actually, more of a painted mark) acknowledging his son Glenn and giving the family’s address. Walter also left behind some “Pool” marks from this year. 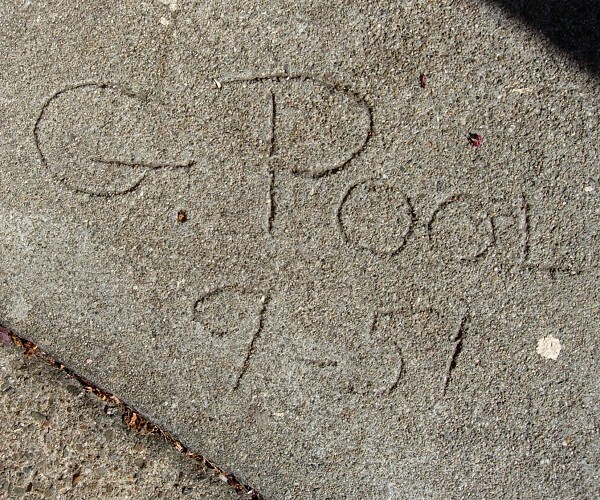 Glenn W. Pool (1905-1984) carried on in the trade at the same address, where he lived until 1935 with his mother and his wife Edith (1908-1986). Here’s the house at 3221 Lorenzo today. Curiously, he was listed in the 1934 directory as “W. Glenn Pool,” perhaps so his late father’s customers could find him. 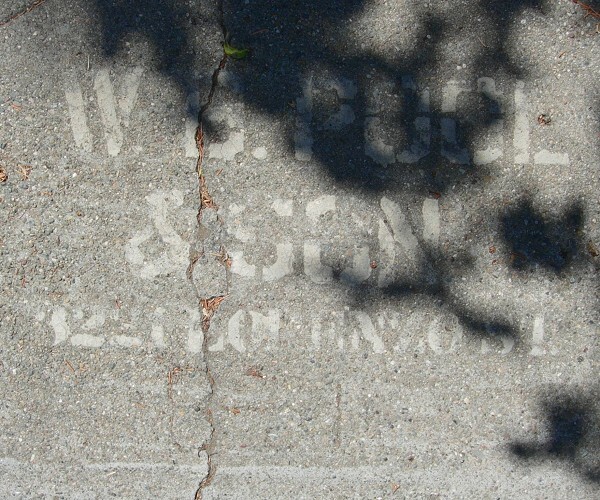 Whereas most of Walter Pool’s work is preserved in middle East Oakland around Allendale and Seminary, Glenn is represented all over Oakland. Glenn Pool did his job with a subtler flair than his father. 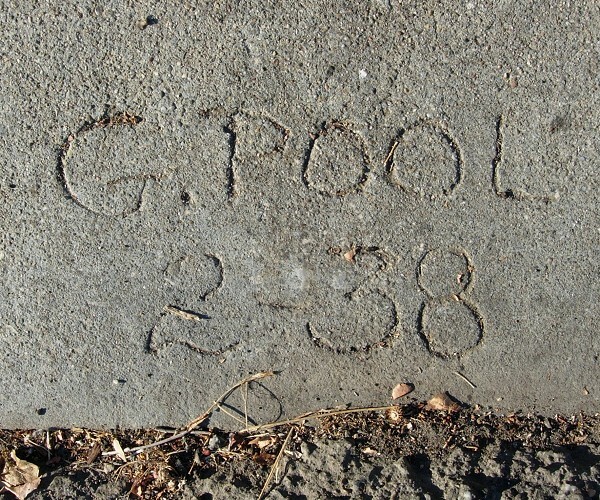 His earliest surviving marks are from 1938, at which time he lived, with his wife Edith (1908-1986), in Alameda at 1064 Central Avenue. At that time he displayed a sure hand but little style. Soon enough, though, he arrived at his mature signature. This is the mark, always hand-signed, that he employed through the war years and into the 1950s. My latest example of his mark is from 1952. The 1940 census listed Glenn, Edith, and Glenn’s mother Meta living at 2610 Grande Vista Avenue, but at the time of their deaths Glenn and Edith were living in Concord. This entry was posted on 28 October 2016 at 8:03 am and is filed under Profiles. You can follow any responses to this entry through the RSS 2.0 feed. You can skip to the end and leave a response. Pinging is currently not allowed.